See the poster attached from Constable Neilly, please print and post in your buildings and on your social media. Also please forward to anyone that may be interested in attending or hosting a similar workshop. As MCA has learned at the Police Services Review, they want everyone to report online any suspicious activity and less urgent stuff. Telephone reporting will eventually be just for the immediate emergencies. We want our residents to be comfortable with online reporting and hope this will encourage everyone to report suspicious activity in Mechanicsville. Mark this on your calender! 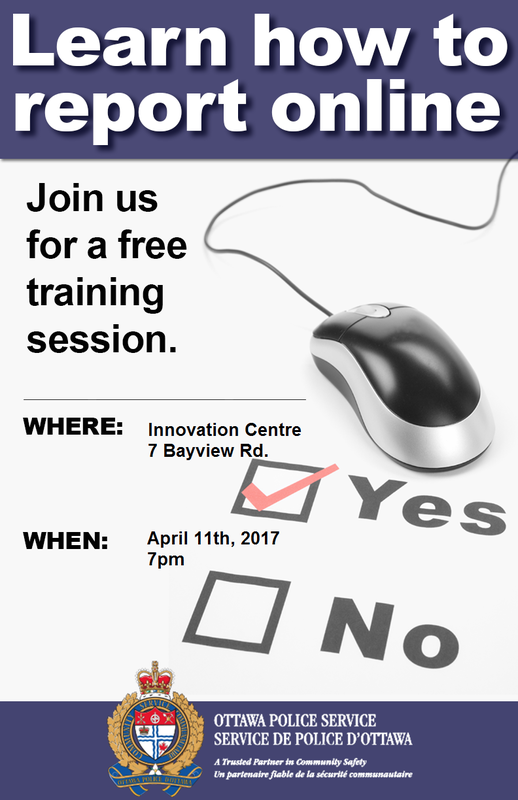 A free workshop on police reporting online in the new, high-tech training room at the Innovation Center at 7pm on April 11th…send the kids and then they can show you! Brought to you by the Mechanicsville Community Association and Constable Neilly! Everyone welcome! FYI: after this workshop will be the Mechanicsville Community Association AGM, the AGM poster to come! I cant believe we got this off the ground!!! We may have to bake some cookies and get coffee donated for this event!! !